Three journalists were injured and dozens suffered from excessive tear gas inhalation as Israeli forces dispersed a weekly protest in Bilin village near Ramallah. Israeli forces fired rubber-coated steel bullets, stun grenades, and tear gas at protesters as they neared their lands near the wall, injuring photographer Abbas al-Momini with a rubber-coated steel bullet in the pelvis, and Palestine TV cameraman Shamekh Jagoub and photographer Haitham Khatib with tear-gas canisters in the abdomen. Participants raised Palestinian flags and posters of prisoners as they marched throughout the village chanting songs for unity and in support of prisoners. Protesters wore prisoner uniforms and played football in front of the prison. Palestinian journalists on Thursday urged the newly-formed national unity government to respond to Israel's decision to prohibit the printing and distribution of Gaza-based newspapers in the West Bank. "Do we need an Israeli presidential decree to be able to print newspapers in territories controlled by the Palestinian Authority?" editor-in-chief of al-Risalah newspaper wrote on Thursday in exasperation over the lack of PA response. On May 28, Israeli soldiers raided the Ramallah offices of the PA-affiliated al-Ayyam newspaper, telling managers that Israel would not allow them to distribute the Hamas-affiliated Falastin, Al-Risalah, and Al-Istiqlal newspapers in the West Bank. The Israeli raid undermined an inter-Palestinian deal that aimed to ensure freedom of press by facilitating the sale of Gaza newspapers in the West Bank and vice-versa. Political analyst Wisam Afifa criticized the Palestinian national consensus government for its unwillingness to stand up to Israel's attack on Palestinian free speech. "We consider that by remaining silent, the government actually accepts the Israeli decision to ban the printing of Gaza newspapers," he told Ma'an. He highlighted that managers of the Gaza newspapers had contacted the Palestinian government spokesperson Eyhab Bseso over the issue, but nothing had been done. "So far, there has been no comment on the prohibition, and we expect a serious and real response to these violations, especially from President Abbas," added Afifa. Similarly, the editor-in-chief of al-Istiqlal newspaper criticized the Palestinian Authority and the national consensus government for not taking any action against Israel's decision to ban Gaza newspapers in the West Bank. Tawfiq al-Sayyid Salim has said that he views the Israeli decision to ban Gaza newspapers as a humiliation to President Abbas himself, belittling his authority. In December, the Foreign Press Association accused the Israeli army of "deliberately targeting" journalists after soldiers fired rubber bullets and threw stun grenades at photojournalists clearly identified as press. The Tel Aviv-based group, which represents journalists of all foreign media, said troops had directly targeted a group of photographers covering clashes at the Qalandia checkpoint between Jerusalem and Ramallah. A 2013 report by Palestinian Center for Development and Media Freedoms counted 151 violations of Palestinian freedom of speech by Israeli authorities, including incidents of "physical assault, detention, arrest, prevention from coverage, travel bans, interrogation, threat, raiding, closing and blocking, trial, and confiscation of equipment." The report also mentioned 78 violations by Palestinian authorities, primarily in the Gaza Strip, though these numbers are believed to be improving particularly since the the agreement to form a national unity government was made at the end of April. The Palestinian Broadcasting Corporation (PBC) strongly denounced the Israeli military invasion against its Jerusalem branch, during live broadcast, and the detention of two employees and a guest speaker. The army and police claimed the broadcast is not licensed by Israel, “therefore illegal and must be stopped”, while the PBC affirmed it is legally operating in occupied East Jerusalem, and obtained all permits similar to all Arab and foreign agencies operating in Jerusalem. It added that, on Friday morning, the Police requested the director of “Good Morning Jerusalem”, Ibrahim Qleibo, and the program host, to stop the show. The PBC said the attack is part of ongoing Israeli violations against the Palestinians and their institutions in every part of occupied Palestine, especially in occupied Jerusalem, the capital of the Palestinian state. The Police broke into the Pal Media office in occupied Jerusalem, and kidnapped show director, Nader Bebers, Pal Media Coordinator, Ashfar Shweiki, in addition to Ala’ al-Haddad, member of a detainees’ committee in occupied Jerusalem. Show host, Mona Abu ‘Assab, was forced to end her live show under gunpoint, after the police and the army invaded the offices and the studio. The PBC demanded Arab and international institutions to condemn the attack, and to expose the ongoing Israeli violations against the Palestinian people and their media outlets, especially in occupied Jerusalem. It said Israel is acting on fully isolating Jerusalem, and separating its indigenous Palestinians from the rest of occupied Palestine, adding that Jerusalem is the capital of the anticipated Palestinian State, and that “the occupation, its settlements and violations, cannot wipe out the deep Arab, Islamic and Christian history, in the holy city”. The PBC further said all Israeli measures, violations and settlements in occupied Jerusalem are illegitimate and violate International Law as Jerusalem is under illegal occupation. Israeli police spokesperson, Luba Samri, said the attack was part of what she called “an investigation into the contents of the show”, according to Ma'an News Agency. Samri confirmed three were kidnapped during the raid, and that they were released later on, and alleged “no programs were interrupted during the attack”. The three were interrogated for several hours, and were denied legal representation. Israeli police raided the East Jerusalem studios of Palestine TV on Friday and briefly detained three staff for questioning, a spokeswoman said. "Police carried out searches at the headquarters of the television channel, as part of an investigation into the content of its programm," spokeswoman Luba Samri told AFP. "Three employees were arrested, questioned and released," she said, adding that "no programs were interrupted and the investigation is ongoing." A Palestinian media report online said two cameramen and one guest on the channel's "Good Morning Jerusalem" program were held for questioning. Israeli soldiers raided the offices of a Palestinian newspaper in Ramallah on May 28, ordering it to stop printing publications by Islamist movement Hamas, managers said. Ten Palestinians were injured including a photographer as dozens participated in protests across the West Bank and East Jerusalem on Friday to mark the 47th anniversary of Israel's occupation of the West Bank and Gaza. Protesters in al-Arrub refugee camp north Hebron, in Bilin, west of Ramallah, in al-Fawwar refugee camp south of Hebron, and in Jerusalem's Old City gathered to mark Naksa Day, a commemoration of the 1967 Israeli occupation of the West Bank, Gaza Strip, Golan Heights, and the Sinai peninsula, a day after similar protests in Hebron and at Qalandiya checkpoint. Six Palestinians were injured and dozens suffered from excessive tear gas inhalation when Israeli forces opened fire on protestors in al-Arrub refugee camp north of Hebron. Medics said that Mutaz Abu Shama, 22, was shot with a live bullet in his left foot, and taken to a hospital in Hebron for treatment during the clashes. Six others were shot with rubber-coated steel bullets and were treated on the scene. Two protesters were shot with rubber-coated steel bullets and a photographer was assaulted by Israeli forces as they dispersed a rally in the central West Bank village of Bilin. Palestinian and international activists marched to the separation wall as it passes through the village, chanting slogans in support of hundreds of hunger-striking Palestinian prisoners in Israeli prisons and against the occupation. After chanting beside the wall for about 10 minutes, organizers said that Israeli soldiers began throwing tear gas canisters and sound grenades at the protesters, while special forces who had been hiding in the nearby hills came running to try to detain some of the protesters. Organizers said that a number of jeeps shooting tear gas "indiscriminately" charged the crowd. Villagers told organizers that two men from the area had been shot by the army, one twice and the other six times. Both were subsequently taken to the hospital, but their conditions were unknown. Palestinian photographer Hamde Abu Rahma was "grabbed by soldiers and told to hand over his camera," organizers said in a statement, but he "was forced to the ground by 6 soldiers" who they said beat him with their guns in his stomach and chest. The commander subsequently confiscated Abu Rahma's camera at gunpoint and took it for 30 minutes, during which time they deleted the photos and broke it, Abu Rahma told Ma'an. 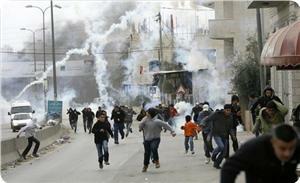 Protests were also violently dispersed in al-Fawwar refugee camp south of Hebron on Friday. Dozens also suffered from excessive tear gas inhalation in clashes in al-Fawwar refugee camp. Dozens of Palestinians participated in a demonstration at Damascus Gate in Jerusalem's Old City marking the 47th anniversary of the occupation of the city by Israeli forces. Sheikh Jamil Hamami, a member of the Supreme Islamic Council that organized the protest, told Ma'an that "Jerusalemites at this demonstration they are expressing loudly their refusal of Israeli occupation." Sheikh Sabri, meanwhile, said that the participants, "send salutations to the prisoners of freedom and we support them," in reference to the more than 5,000 Palestinian prisoners currently in Israeli jails. The Grand Mufti of Jerusalem Sheikh Muhammed Hussein said that "Israel is trying to Judaize the humans and stones of Jerusalem and hide the city's Arab and Islamic features, but Jerusalem will remain the heart and the eternal capital of Palestine." Israel occupied East Jerusalem in 1967 and annexed the area in 1981, in a move not recognized by the international community. Palestinian officials frequently condemn what they refer to as the "Judaization of Jerusalem" on the part of Israeli authorities, who they say engage in policies that discriminate against Palestinian residents and seek to encourage their departure from the city. This policy involves the denial of construction and long-term residency permits to Palestinian residents while allowing the construction of thousands of settlement homes for Jews in order to shift the demographic balance. 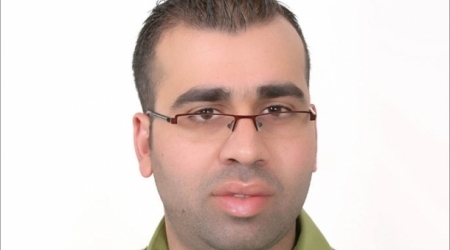 Israeli Prison Service (IPS) released Wednesday evening Palestinian journalist Ahmed al-Bitawi from Nablus city and put him under house arrest. IPS released Al-Bitawi,32, on NIS 20,000 bail after serving three consecutive months of detention in the Israeli prisons. Al-Bitawi, an activist in defending the cause of Palestinian detainees, works as a journalist at the office of lawyer Fares Abu al-Hassan in Nablus. On 20 February 2014, Israeli military detained al-Bitawi during an arrest campaign carried out against Abu al-Hassan’s office. Last week, Israeli occupation released Osama Maqbul, the lawyer of administrative detainees, from Nablus. 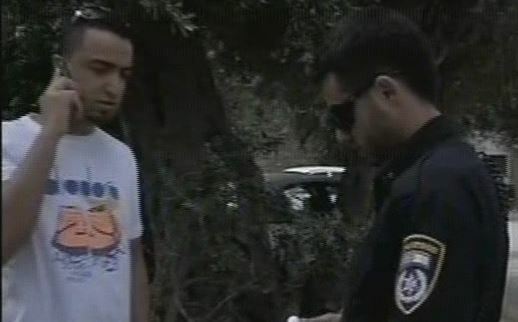 Mohammed al-Abed from Acre also was released and put under house arrest. At the end of December 2013, 4,768 Palestinian security detainees and prisoners were held in Israeli prisons, 317 of them from the Gaza Strip. An additional 1,284 Palestinians were held in Israel Prison Service facilities for being in Israel illegally, 20 of them from the Gaza Strip. Nine Palestinians were abducted and three injured by Israeli forces after they violently dispersed a public protest, by Palestinians, in Jerusalem's Old City. A multitude of Palestinians gathered near Damascus Gate, raising Palestinian flags in protest, on Wednesday, as thousands of Israeli Jews celebrated Israel's occupation of East Jerusalem in 1967, also known as "Jerusalem Day". Forces fired tear gas and stun grenades as they assaulted the protesters with batons. 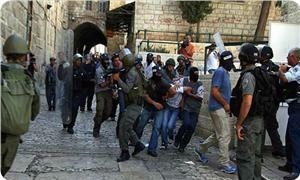 Nine Palestinians were arrested during the protests, according to Ma'an. Eight were identified as: Ghaith Ghaith, Raafat al-Ajlouni, Murad Abu Sbeih, Mohammed al-Qam, photojournalist Rami al-Khatib, Muhammad Sharha, Tamer Khalaf, 28, and Muhannad Ghaith. The identity of the ninth person abducted was unclear. Dozens are reported to have suffered bruises and the effects of tear gas inhalation, while three were rushed to a nearby hospital. One crew member of the ambulance team was sprayed with tear gas, as they attempted to evacuate the wounded. Press crews were also assaulted by police and Jewish civilians, as they attempted to document the protest. Details and photos at Ma'an News Agency. Huge discrepancies between East and West Jerusalem have also been reported, in terms of education, health, water access, and planning, while Israel has also revoked the residency of 14,309 Palestinians since 1967, with 106 in 2013 alone. 14 percent of East Jerusalem has been zoned for Palestinian residential construction, according to ACRI, while one-third of Palestinian land has been confiscated, since 1967, for the purpose of building Jewish-only settlements, which are illegal under international law. The so-called "separation wall" has also cut off East Jerusalem from the West Bank, forcing nearly 100,000 Palestinians in various areas to live in abject poverty on the outskirts of the city. 60,000 - 80,000 Palestinians in these neighborhoods have been cut off from a regular water supply for over three months. Israeli Occupation Authorities (IOA) prevented on Wednesday printing or distribution of Gaza-based Palestine newspaper in the West Bank. Israeli occupation forces stormed at dawn Wednesday al-Ayam newspaper headquarters in Ramallah and ordered its managers not to print or distribute Gaza-based Palestine newspaper in the West Bank, after the confiscation of its edition. For its part, Palestine newspaper administration vowed to continue the distribution of its editions in the West Bank by different means despite Israeli threats. The newspaper's director-general Iyad Qarra told PIC reporter on Wednesday morning that al-Ayam publishing house's managers had received "clear threats" that the IOA would take firm action to prevent the printing and distribution of Gaza-based newspapers in the West Bank. “In case al-Ayam publishing house refused to print our newspaper, we will be forced to look for other publishing houses”, Qarra added. 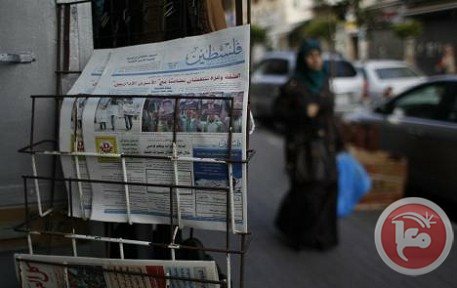 Under a recent reconciliation deal between Fatah and Hamas movements, Gaza-based newspapers were allowed to be distributed in the West Bank last month and vice versa. 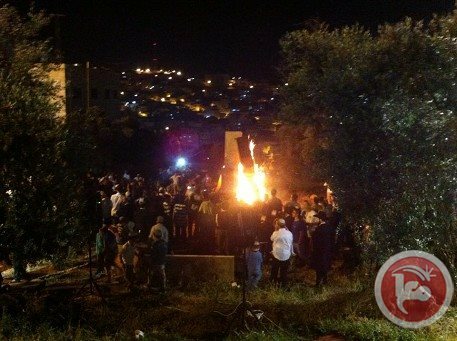 Israeli settlers set fire to a private Palestinian field in the Tel Rumeida neighborhood in the southern West Bank city of Hebron on Saturday night as part of a celebration for the Jewish holiday of Lag BaOmer. Settlers circled around the field and watched as the fire burned olive trees, in a field that locals said belongs to the Iqneibi family. Some of the settlers reportedly assaulted a cameraman who works for the Israeli daily newspaper Haaretz as he tried to take film the fire. Lag BaOmer marks the the death of a 2nd century sage associated with Jewish mysticism, and is traditionally marked with bonfires. Activist and co-founder of the Hebron activist group Youth against Settlements Issa Amro told Ma'an that Israeli settlers have recently been harassing and assaulting the Palestinian residents of Tel Rumeida in an attempt to scare them and get them to leave their houses and lands. Hebron is a frequent site of tensions due to the presence of around 500 Israeli settlers in the Old City, many of whom have illegally occupied Palestinian houses and forcibly removed the original inhabitants. Tel Rumeida hosts one of the most militant Jewish settlements in the city, and locals complain of near daily harassment and attacks by the groups, who are under heavy Israeli military protection. 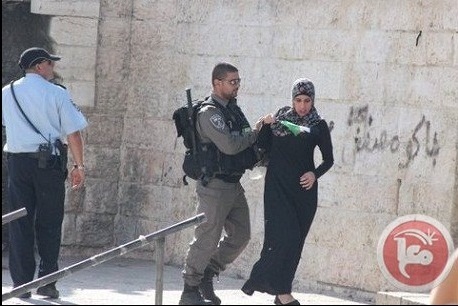 Violent confrontations were reported inside the Aqsa Mosque in occupied Jerusalem immediately after the Friday prayers during which six Jerusalemites were arrested including two cameramen. The PIC reporter said that Israeli special forces fired sound bombs and teargas at the worshipers and chased them inside the holy site. He said that policemen detained Amjad Arafa, a cameraman working for the Aqsa satellite TV station, on his departure from the Mosque. Meanwhile, two Jerusalemites were injured in confrontations in Issawiye village, east of occupied Jerusalem, on Friday. Local sources told the PIC reporter that one of the citizens was wounded in his head while the other suffered injuries in his neck, describing their injuries as moderate. 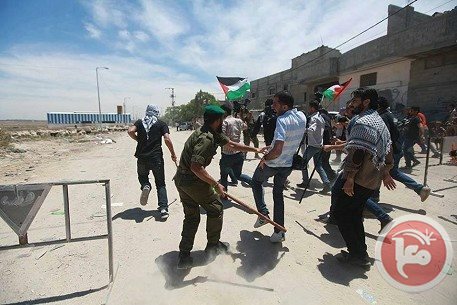 More than 20 Palestinian citizens were injured in clashes with Israeli occupation forces (IOF) in front of Ofer jail, south of Ramallah, afternoon Friday. Journalists said that IOF soldiers deliberately fired metal bullets, sound bombs, and teargas canisters directly at them, injuring photographer Issam al-Reemawi, who works for al-Hayat newspaper based in London, with a bullet in his shoulder. They said that another photojournalist, Abdulkarim Musaitef, suffered breathing difficulty and was rushed to hospital. The PIC reporter said, quoting eyewitnesses, that the soldiers fired dozens of teargas canisters to quell the protest march by hundreds of young men, who were angered at the killing of two youths at the hands of those soldiers on Thursday. The demonstrators marched to Ofer jail after laying the two young men to rest, the eyewitnesses said, adding that they were also marching in support of Palestinian prisoners on hunger strike for more than three weeks. 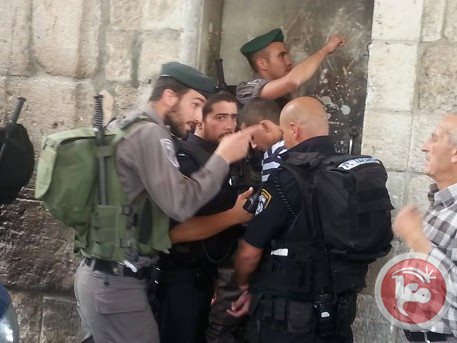 Israeli forces detained eight Palestinians in East Jerusalem's Old City on Friday. Six men were detained as they left the al-Aqsa mosque compound for allegedly throwing stones and firecrackers at Israeli police near the Moroccan Gate. They were taken to a police station near the Lion's Gate, where they were assaulted and then transferred to another police station, a Ma'an reporter said. 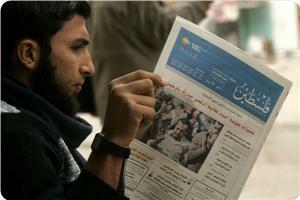 One of the detainees was identified as Amjad Arafeh, a journalist. Earlier, Al-Quds newspaper photographer Rami Alariya was briefly detained for two hours near the Old City and released on condition that he does not enter the area for 24 hours. The Gaza Strip ministry of interior pledged on Thursday to open an investigation into violence used by the security forces against journalists who were covering a rally east of Gaza. 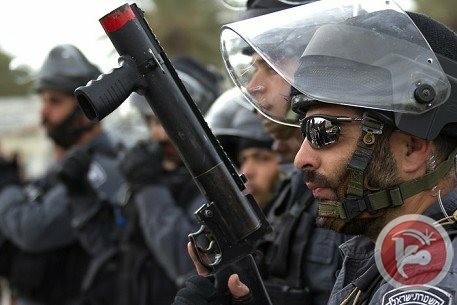 Spokesman for the ministry Iyad al-Bizm said they were distressed by the "unjustified behavior of security forces with demonstrators and journalists." Al-Bizm added that the incident "will not go unnoticed" and an investigation has been opened to hold all violators of the law accountable. He explained that security forces "rough handling" of demonstrators was to prevent them from reaching zones of tension with Israel and to preserve their lives, but he added that "other measures could have been taken to achieve that goal without abusing or assaulting demonstrators." Israeli forces frequently shoot at farmers and other civilians inside the Gaza Strip if they approach large swathes of land -- between 500 and 1500 meters from the border -- that the Israeli military has deemed off-limits to Palestinians. Gaza security forces, however, rarely intervene to stop protestors or journalists from approaching the area.